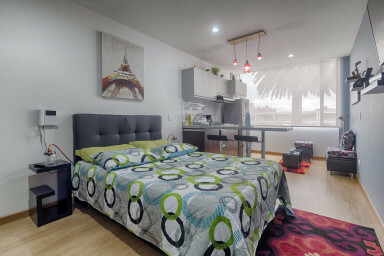 Studio located in one of the best neighborhoods in Bogotá, comfy bed and a fully equipped open style kitchen. The apartastudio is located in Chapinero (Carrera 57 # 14 – 23, Edificio K57), one of the most central and exciting neighborhoods in Bogotá. The apartastudio is located in Chapinero (Calle 57 y Carrera 14), one of the most central and exciting neighborhoods in Bogotá. It is a culturally diverse hotspot, full of nightlife, commerce, and universities, a definite favorite amongst visitors to Bogotá.